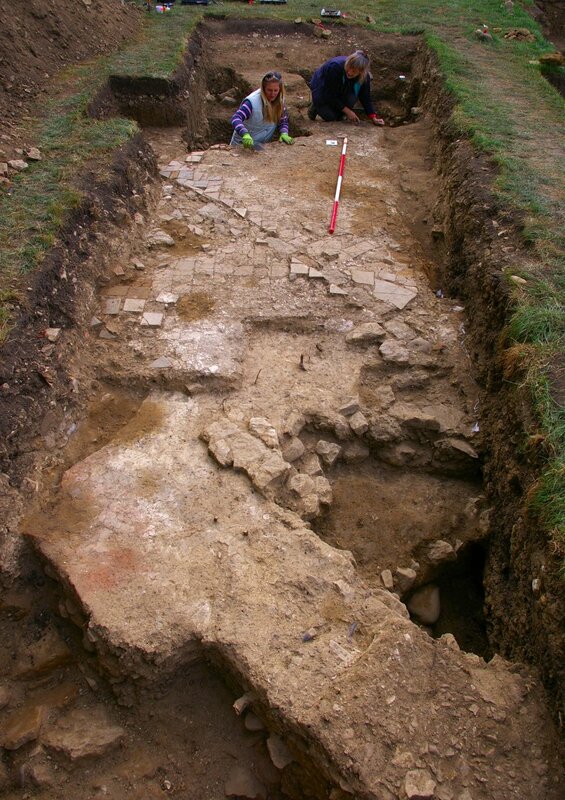 ULAS archaeologists have been working with local volunteers to uncover the lost chapel of St Morrell overlooking the small village of Hallaton in east Leicestershire. The Fourth year of excavations with the Hallaton Fieldwork Group (HFWG) has revealed the full plan of the chapel as well as the cemetery and evidence that the hillside has been used since at least the Roman period. Pilgrim badge with ‘Morrell’ inscribed. The location of the chapel was unknown before research by local historian John Morison suggested it might be on Hare Pie Bank where the annual Easter Hare Pie Scramble and Bottle Kicking take place. Geophysical survey by HFWG showed a square boundary (approximately 36m across) with features inside it. 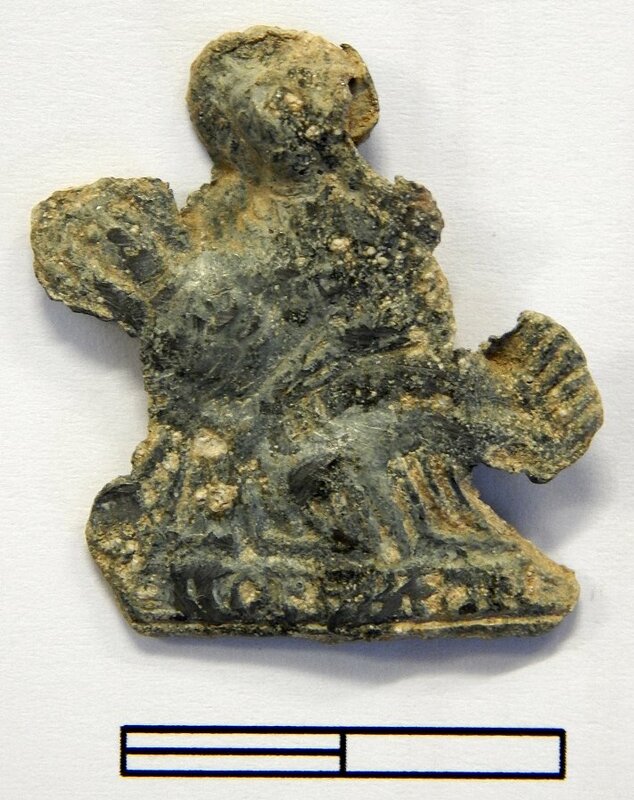 Subsequent excavations by ULAS and the group have uncovered the chapel thought to be a place of pilgrimage in the medieval period and a pilgrim badge with ‘Morrell’ inscribed on it was found within the walls of the chapel. The excavations have identified the walls and tiled floor of the chapel as wells as fragments of stone masonry, wall plaster, tiles and lead from the windows. A number of silver pennies dating between the 12th – 16th centuries have also been found on the site indicating when the chapel was in use. Some of the medieval coins found around the chapel. 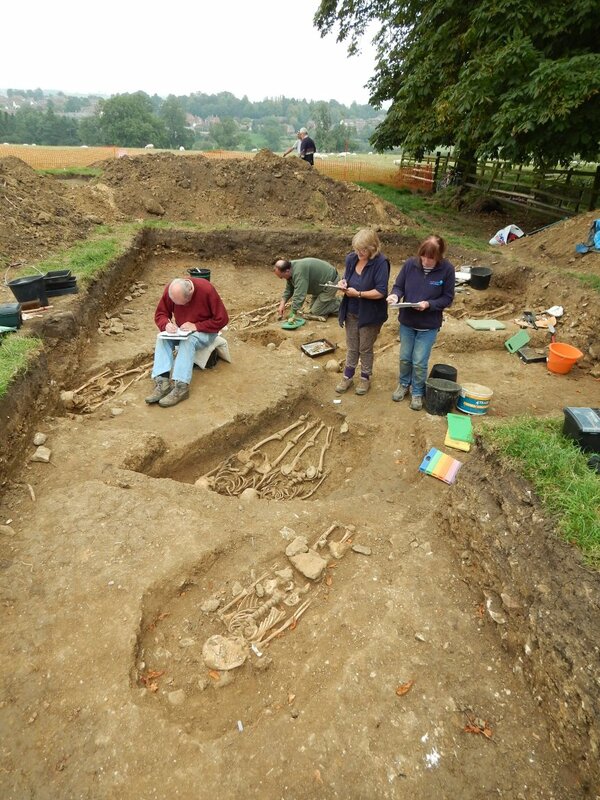 Archaeologists record some of the skeletons found at the chapel. One of the most intriguing aspects of the site is the cemetery which lies on the north side. A total of 11 skeletons have been excavated (although there are likely to be more) all orientated east-west in the Christian tradition and radiocarbon dated to the 14th century. One older male was killed by a sharp weapon such as a pole axe to the head (presumably in battle). Another young male was buried in a pit with his legs raised to his chest, possibly the result of a medical condition; analysis of his teeth suggest he had suffered trauma in his early childhood. Another man and women had been buried together in the same grave, placed side by side with their arms crossed together. 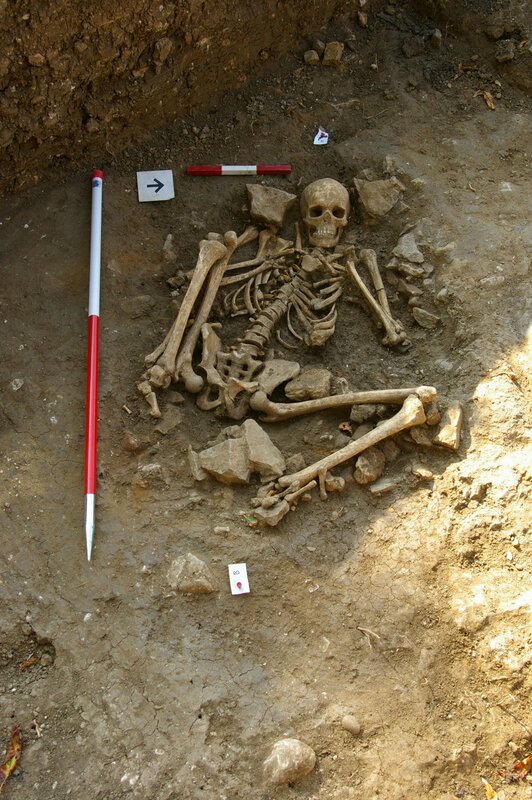 Skeleton of a young male buried with his legs raised to his chest. 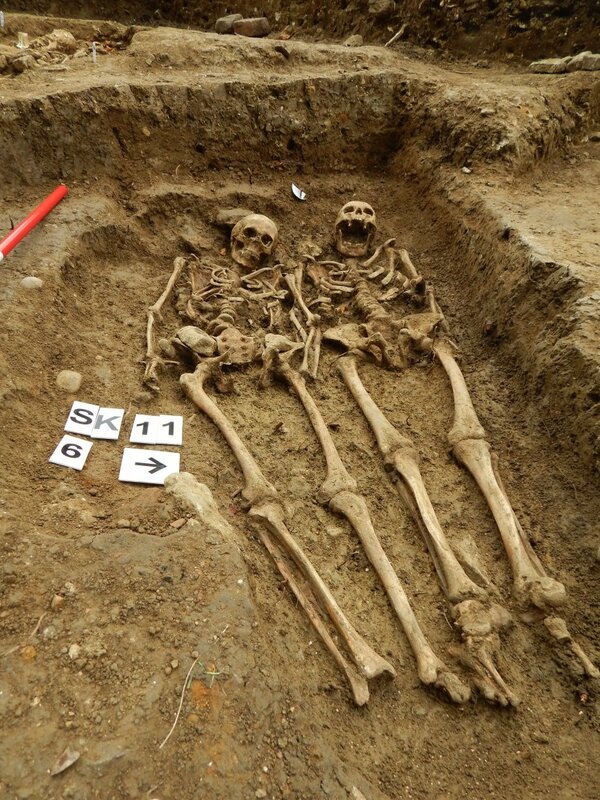 Skeletons of a man and women buried side by side with their arms crossed together. Why these people were buried here rather than in the main church in the village is unknown but it is possible that this was a special place of burial, perhaps specially reserved for pilgrims. Antiquarian William Burton mentions in 1641 that ‘Halloughton…a place of special holiness (the etymon of the name importing as much as Holy-town) so as sick folks did use to flock thither to die.’ Alternatively, they might have been refused burial in the main church, perhaps because they were criminals, foreigners or sick and diseased. Roman remains were also found beneath the chapel including a square ditch around the site which might suggest that the hilltop was originally the site of a Roman temple – especially as it lies only a few hundred meters away from the Iron Age shirne where thousands of coins and silver objects including a Roman cavalry helmet were ritually buried. This could mean that the hilltop has been used as a special place for over 2000 years. A recent open weekend to promote the excavations was hugely succesful, with the local school being given a tour of the excavations and several hundred people visiting over the course of the weekend.